This IBM Redbooks publication provides an overview of DB2 Information Integrator V8.2 key performance drivers; best practices to achieve optimal performance; and guidelines for monitoring a DB2 Information Integrator environment for capacity planning, problem diagnosis, and problem resolution. 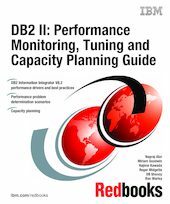 This publication documents procedures for monitoring existing DB2 II implementations for the purposes of capacity planning. It also documents a methodology for routine and exception monitoring of a DB2 II environment for performance problem determination; and describes some commonly encountered performance problem scenarios and the step-by-step approach used in problem determination and resolution.